If you're redesigning your kitchen, how you dress your windows will be important for giving it that fabulous finishing touch. But kitchen window treatments aren’t straightforward. Of course, your choices have to regulate light, and allow you to control privacy, plus look stylish. But add to that the need to tolerate splashes near the sink and cooking area and the moisture levels of a busy kitchen, plus the stipulation that they’re easy to clean, and that’s quite a list of requirements. Which window treatments do all the necessary? Here’s the lowdown. Find more window treatment ideas for all your rooms on our dedicated hub page. Whether you need to dress large glazed doors, small casement windows or anything in between, it’s vital that kitchen window treatments are chosen with the specific zone of the room in mind. Above sinks and in close proximity to the cooking area, go for moisture-resistant kitchen blinds, or robust shutters. Further away from the working zone of the room, treatments such as Roman blinds and curtains are appealing because they’ll introduce softness to a space that’s filled with hard materials. Light control’s important for both comfortable preparation and dining, so where direct sunlight’s an issue, adjustable Venetians and plantation shutters are practical choices. Think privacy as well. A kitchen with a garden view may not require a window dressing that conceals all. Room in plain sight? Consider the benefits of made-for-privacy blinds, panels, shutters and window film. If you need a window treatment for a tight space, such as a window above a sink, or want to leave the windowsill free for kitchen storage or display, window film’s a winning dressing. For maximum privacy choose a stained glass style design, like this Palanga in Amber, or go for a plain etched look to boost light coming in. From £11.50 for a 50cm x 25cm panel, Purlfrost. Find more window film ideas in our design gallery. Whether you have traditional French windows, contemporary bi-fold doors or sliding doors, once darkness descends it’s cosier to be able to shut out the night. These Warwick Silk White tracked shutters from Hillarys, from £375 per square metre including measuring and fitting, suit all outward opening doors, as well as sliding versions. Read our guide to choosing the best shutters for your kitchen. Rooflights boost natural illumination in a kitchen, but the addition of a blind can be useful to soften the light and prevent glare as the sun moves round the house. These roller blinds from Velux are power operated and come in a choice of 15 colours. From £72. Check out our gallery of blinds for glazed extensions and roof windows. Looking for the softness of fabric but the adjustability of a slatted blind? This Zebra roller blind in Pale Ash with clip on matching pelmet in Ash, £193 for 139.5cm x 110cm, Bloc Blinds, is made with coloured and transparent fabric bands on a loop. Via the pulling together of similar bands they allow either maximum light or maximum privacy at different times of day. 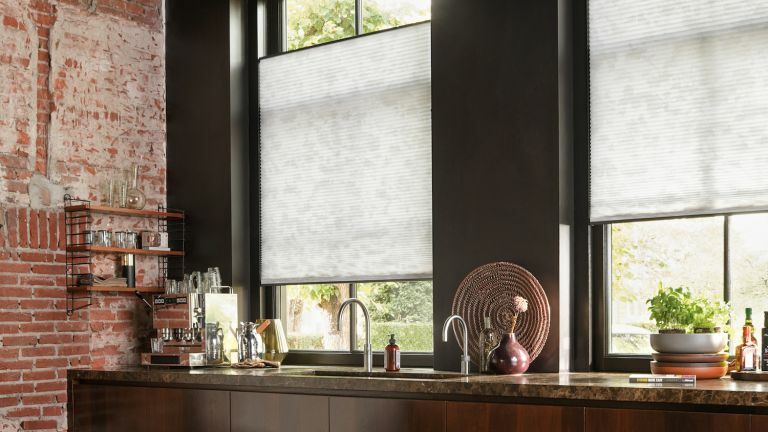 Find more kitchen blinds in our dedicated feature. Take the opportunity to indulge in more opulent window treatments for a dining area that’s set apart from the working space of the kitchen. Here Kensington Dijon curtains, from £256 for a 1600mm x 1000mm made-to-measure pair, have been teamed with Sion Mimosa Roman blinds, £183 for a 600mm x 600mm made-to-measure, both from Style Studio, to give the windows a luxurious finish. Use our guide to pick the best curtains for your kitchen, and don't miss our guide to choosing Roman blinds, too. To manage the problem of being overlooked when your kitchen’s street facing while keeping the daylight coming, try a highly manoeuvrable window treatment. These top-down bottom-up blinds can be adjusted upwards or downwards so you can position them at any point on the window as needed. From £150 for made-to-measure, Duette. Fitted into the window recess, shutters are a neat way to dress kitchen windows without intruding into precious work space. Easy to clean, they can be fitted in hard-working areas – a wipe down will have them pristine once more. Louvered shutters, from £299 per square metre, Shutterly Fabulous. If you’ve picked cream or white kitchen units for their space-stretching qualities, why not use your choice of window treatment to add an accent shade that can be repeated in other kitchen accessories? This pink Venetian blind, from £79 for a 610mm x 610mm made-to-measure aluminium from Apollo Blinds, adds energy to the scheme as well as regulating light. Read our guide to choosing Venetian blinds to get the right ones for your kitchen. Vertical blinds can help draw attention to the grand scale of large windows and patio doors, or make a small window feel taller by drawing the eye upwards – ideal in a small kitchen. Find out how to design a small kitchen in our guide. In this kitchen, made-to-measure vertical blinds by English Blinds enhance light and space. If it’s a barrier to stop small creatures finding their way into your kitchen you need at patio doors or kitchen windows, take a look at this S2 screen from Centor. It can be fixed to the interior or exterior of French, sliding or single patio doors, as well as wood, aluminium or uPVC windows, and paired with new glazing or retro-fitted. Find out how to create space and light with glazing. If your windows are double-glazed, if the view of your garden, both in daytime and lit at night, is fantastic, and if you're not overlooked, why not leave your kitchen windows undressed? In a period room with lots of decorative detail you can easily get away with this. In a contemporary room with lots of hard surfaces, beware of the echo and consider adding a rug and some soft furnishings to absorb sound. Of course, many kitchens look just fine without any window treatments, and you may well want to make the most of a nice large window and the light it brings in. But what if your kitchen faces a busy road – or, conversely, a dull fence you don't fancy looking at? That's where a smart blind comes in handy. Take inspiration from this graphic monochrome blind that works brilliantly with the black-and-white design scheme by Humphrey Munson. To continue with the monochrome theme, check out our gallery of white kitchen ideas.